them to be successful in marriage and understand the virtues of the covenant vow. The objective is to eradicate the increased divorce rate in the church and to establish longevity in marriage. We will focus on healing wounded relationships in the marriage through the virtue of forgiveness and finding a common place to re-establish, ignite and maintain the flame of love and affection in and excellent manner of expression. SWORD will spread the Kingdom principles from the church walls to souls locally and then globally. 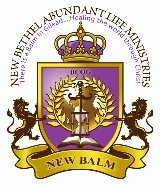 The New Balm Academy of Higher Learning is more than an institution, it is an entity that empowers leaders in the five-fold ministry, fathers and mothers through the Word of God, provides workshops, and seminars coupled with secular education. We are endeavoring to create an apostolic network of Kingdom-driven churches, ministries, and mission organizations all committed to helping God's people fulfill the Great Commission through His love.